Kairouan is defined as the holiest city of Tunisia, being the oldest Islamic settlement, having the oldest mosque in North Africa and the world’s oldest minaret. But there is more to the story: In 670, the general of the invading Arab forces, Oqba bin Nafi, found a golden cup in the sands here, a golden cup that he had lost in the holy well of Zamzam in Mecca a few years earlier. When picking the cup up, water sprang from the ground. This is said to be source of the Bi’ Barouta, Kairouan’ most popular attraction among Muslims. Among the very first projects of the conquering Arabs was to built a great mosque. A city grew quickly up, and around 800, Kairouan became the capital of the Aghlabid dynasty. This would last a little bit more than a century, before the Fatimids made Mahdia their capital. 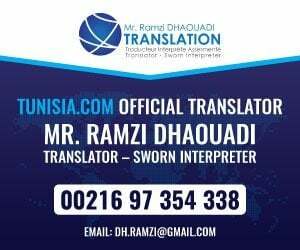 The city was for a long time characterized by not being much touched by the French, who wanted to respect the sentiment of the Tunisians. For a long time the whole city was kept inside the city walls, and no Ville Nouvelle was ever constructed. Kairouan is a great tourist destination, being the best place in Tunisia to learn about the country’s Islamic history. In addition to the Great Mosque there are a number of smaller, still very interesting and attractive, religious institutions open to non-Muslims too. The Great Mosque of Kairouan dates back to 670 CE and was built by the command of Arab Muslim general Oqba bin Nafi. Although it has been destroyed a couple of times, then rebuilt, today’ structure rests much upon the original mosque. The most extensive destruction came few years after the original construction, in 688 when it was destroyed in a rebellion. The present layout was created in the 9th century, but it is hard to establish which parts date back to this date. The base of the minaretis though to be some 100 years older than this. 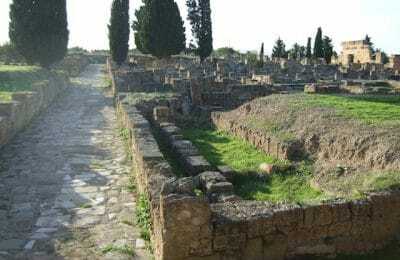 Still, the columns of the prayer hall are even older, having been taken from Roman and Byzantine structures in Carthage and Hadrumetum (Sousse). Standing inside the mosque’s courtyard, you will probably not be able to see that everything tilts, none of the corners are 90 degrees and the minaret does not stand on the axis running from the mihrab through the entrance to the prayer hall, rather about 8 metres to the right. The colonnade along the 3 other sides but the minaret one, is impressive. Simple and beautiful. The first mosques erected in early Muslim time did not have minarets – the believers were called to prayer by the muezzin standing on the mosque roof. But it is believed that with the expansion of Islam, the many churches with their towers paved the ground for adding towers to minarets as well. Most seem to agree that the lowest storey of the minaret in Kairouan are the remains of the first real minaret in the world, dating back to 730, more than 100 years after the death of the Prophet Muhammad. It is quite impressive even today, but note how much thicker it is than more recent minarets. It is 31.5 metres high with a base of 10.7 metres square. It consists of 3 sections, where the first is 19 metres, the second 5 metres and the third 7.5 metres including the dome. The minaret appears first as very simple, but a closer look will reveal some interesting details. The two top photos show how it at first was built with bits and pieces from older structures. The decorations around the door do not even fit, intriguing. The second photo shows one of two Roman bricks with inscriptions. The other brick is placed upside down. Looking further up the minaret can usually only be done with your camera zoom or with binoculars. Most of the time it is closed for entry, but if you’ lucky you may be able to climb its 128 steps to the top. Note here the Roman columns used as the only form of decoration. From below, note how the window niches get larger as further to the top. One of the legends on the prayer hall of the Great Mosque says that anyone trying to count its columns will become blind. The columns were of Roman and Byzantine origin, and brough here from as far away as Carthage and Hadrumetum (Sousse). None two are said to have the same shape and size. It must have been with great awe that the Muslims of the early centuries of North African Islam entered this vast hall, some 70 times 40 metres. Unfortunately, the hall is closed for non-Muslim visitors, but usually, some of the doors are open. The impressive 19th century allows limited views, but you will be able to see the mihrab, which is noted for being framed by 130 faience tiles imported from Baghdad in the 9th century. By the way, the number of columns is 414. It looks like a minbar, but at the top there is a sundial. Koranic inscription on one of the columns, right in from the main entrance. With its simplicity, the detail of the Great Mosque becomes quite effective. In the courtyard there are a number of objects which seems like they were randomly placed there during an excavation or something. But in fact, it is a question of 4 wellheads, looking like the base of Roman columns, a drain and a minbar-like sundial. There is a second sundial on the eastern colonnade, which was used in afternoons. Drain in the middle of the courtyard, used to collect rainwater which was preserved in underground cisterns. Note what looks like useless decorations around the hole. It is really made to remove dust from the water before it came to the hole. Lalla Rihana Gate is one of the newest additions to the mosque, dating from 1294, built after Hafsid designs, with its arches and cupola. Further on are the eastern walls of the courtyard. The outer walls and the gates to the mosque is not to be missed. The entire structure reflects the position of the mosque in the early Muslim conquest of North Africa, a time when no stable state had yet been established and the mosque had to double as a fortress. From atop you really see that the first impression of the mosque as a fortress is not accidental. Leaning walls would have made it very easy to defend to aggressors. Not historically or culturally important, this little graveyard is splendid to make photos. The whitewashed graves stand in front of the city walls with the minaret of the Great Mosque above. . The zawiyya of Sidi el Ghariani is a beautiful little structure, where you can take a closer look at 14th century woodcarving and stuccowork. The tomb inside is suprisingly not the one of Sidi el Ghariani, but the 16th century Hafsid sultan Moulay Hassan. Sidi el Ghariani relates to the governor family of Kairouan from the 15th until at least late 19th century, which originated in the Libyan town of Gharyan. However modest the Bi’ Barouta is – entrance through a small carpet shop and an interior no more spectacular than a middle-class family’s courtyard – it is the historical focal point of Kairouan. It is this well that has elevated Kairouan into its prominent position in the heart of devout Muslims in this part of northern Africa. There are two legends: The first tells that the Muslim conqueror Oqba bin Nafi put his stick into the ground right here, and out came water. The other story, is the most popular, says that Oqba found a golden cup gold he had lost in the Zamzam well in Mecca. This was considered a proof that there was a underground river between Mecca and Kairouan, making the water of Bi’ Barouta holy. Even today, the local religious traditions says that a Muslim drinking water from Bi’r Baruta a number of times is exempted from performing the pilgrimage to Mecca, a journey both long and expensive. A blindfolded camel is pulling the wheel, and the water that flushes out of the mugs you see on the picture is free to drink for anyone, Muslim or non-Muslim. This mosque is noted for its three doors, a rather uncommon facade for a small mosque integrated in the street structure. Unfortunately, the entire inner structure is off-limits for non-Muslims, and the doors are closed for even a small peek inside. The mosque dates back to the 9th century, a period from which there is little else in Kairouan. It was founded by Kairoun al-Maafri, a holy man of Cordoba. Note the rich inscriptions above the doors, the top two bands are actually the oldest. Between the two top bands, is a band of floral decorations. The walls right to the west of Bab ech-Chouhada. 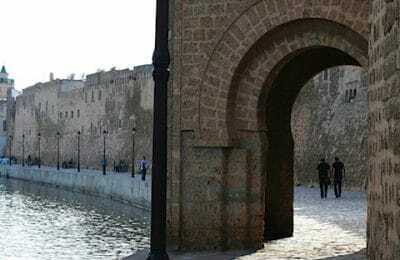 The oldest gate of the city walls, the Bab al-Khoukha, which dates back to 1706. In from the city walls, few buildings lean on the walls. There are occasionally small kiosks built into the wall structure, often used as shops. You can make out the door to one of those on this photo. The history of Kairouan’s city walls date back to 761, but have been destroyed and rebuilt numerous times. Today’s discontinuing walls are far from as old as they seem, many parts were rebuilt as late as after World War 2. The oldest surviving parts date back to the 18th century, as do the oldest gate. The best wall parts are around the Bab Chouhada, which also serves as the main entrance to the most popular areas of the medina. I highly recommend an evening stroll along the walls, when headlights create an effect equal to the best Oriental images of the Muslim city. This zawiyya is claimed to house the tomb of one of the prophet’s companions, a sahab, named Abu Zama al-Belaoui. It is also called Mosque of the Barber, as he was known for always carrying with him 3 hairs of Muhammad. On the photo to the left, you see the original mausoleum, dating back to the 7th century. It is certainly something else, with its Jerba-like minaret-on-a-dome finish. The rest of the complex is far much younger, built a 1000 years later. It contains a number of courtyards, a madrasa, a mosque and a funduq (for pilgrims. It is quite a strange structure, you really never get a realistic impression of its dimensions. From the outside it really looks huge, from the inside you will start looking for that large room or courtyard, but all you find are small rooms and courtyards. The most sacred is the grave of Sidi Sahab, which cannot be entered by non-Muslims. But really, what you see from the outside is more than enough, the doors are wide open. Amor Abbada was a strange kind of blacksmith philosopher, creating oversized objects full of inscriptions explaining their purpose. Like swords that should protect but not kill and candles of wisdom, keys that only God can turn (photo left). The whole museum-like presentation is very attractive, all set in his (now desanctified) zawiyya beneath two of its domes. The caretaker, Khammeri, is very enthusiastic and helpful. The lower photo shows his burial place. A wooden cage protects the spot where he was placed to rest in the ground. Not uncommon, but the tablet with Koranic and non-Koranic inscriptions is different from what I have usually seen. Amor Abbada was not always philosophical in a way that can appeal to modern people. He also claimed that two anchors which he gave his home town had come from Noah’s Ark on Mount Ararat, anchors which were said to fasten Kairouan to the earth. They can be seen half way down the eastern walls. 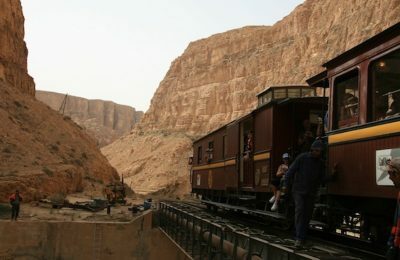 There are today two ways of visiting the Aghlabid pools, either by the tourist centre or the western gate leading into the park. From the tourist centre there is no gate into the park itself, all that is on offer are views from atop the building (see top photo). There are two reasons for this: from up here it is possible to get good views and photos, and you don’ get to see how filthy the pools have become. Things were much cleaner before the tourist centre was opened. Forget all that, though, and try to get a touch of the history behind the pools. The construction is a 9th century achievement, and was used as exactly what it looks like, a water reservoir. Water came from the hills 35 km west of Kairouan, delivered here by aqueduct. The largest pool is 128 in diametre and 5 metres deep. The structure in its middle are the remains of a pavilion used by the elite of Kairouan to relax on summer evenings. The two western-most pools. You can just about see the smaller one, right above the tree. The eastern-most pools, which are the least attractive and also considerably smaller. But at least here my camera’s (not-so-) wide angle managed get it all into one photo. Kairouan has seen quite a bit of white paint and chalk in recent years, the whole medina looked so much nicer in 2005 than it did when I visited it in 1996. On a whole I have no hesitation in suggesting that a slow walk around the area is a must for visitors to Kairouan. And it is easy to fit into you schedule too. Walk between anywhere on Avenue 7 Novembre (shopping area and the Great Mosque), and you will see life styles of old days in a fresh and attractive wrapping. Look out for the many religious buildings, most can easily be located by their domes. Woodwork details can be quite excellent many places, too, but in general it is the simplicity that really makes Kairouan so nice. Along the route between the shopping quarters and the Great Mosque, there are some important religious buildings. The Zaouia Sidi el Ghariani is so beautiful that it has been used many times as for signature photos for Tunisia, while the Mosque of the three doors is noted for, yes, exactly, its three doors. Shopping quarters of Kairouan are really just centred to the Avenue 7 Novembre and adjacent streets. You will not have have to go far off the area to find yourself in tranquil residential streets. Shopping in Kairouan resembles many other tourist places, but there is a selection of locally produced items for sale too. The most noteworthy are carpets, sold from many different shops. The understanding of their quality and design is very a much a question of preference, but one rule applies all over: Buy only what you like for yourself, and do not be convinced that this is an investment of any sort. Once you leave Tunisia with your carpet, they lose most of their value, and they cannot be compared to the market position of Persian carpets. Kairouan during the last shopping hours of the day can be quite attractive. New colours appear, lights are sometimes coloured and shadows dramatic. Old places like the shopping streets of Kairouan have been designed much to serve the needs of its inhabitants in the late afternoon and evening hours, that is the time when temperatures fall to a pleasant level. It is clear that the use of lights are quite deliberate to make surroundings attractive. Everything from basic to 4 star. Value of money is good, and through most of the year, finding a room is very easy. How hot Kairouan can be may be illustrated with the accommodation section in Lonely Planet. Usually, LP is extremely reliable for hotels, but for Kairouan about everything they write is wrong. They come out calling Hotel Splendid run down and with a “surly staff”. Which is totally wrong! And the Menema comes “highly recommended!”, despite being dull, overpriced and with a bad location. Charming 3 star Hotel Splendid, which has nice, friendly rooms at a reasonable price. Similar to the hotel situation, Kairouan offers most standards, and everything at friendly prices. Plenty of eateries to choose from. Night life in Kairouan is travel oriented: Many people pass through Kairouan during night, and demand a place to eat and drink soda water or coffee. In some of the better hotels, you’ll find bars, but these places can be dull and half empty. No problems. Banks, ATMs and exchange service in the receptions in the better hotels. Many shopkeepers will accept to be paid by VISA or MasterCard, provided that you buy above 10-15 dinars. Excellent, except that there can be some distance between different stations. Kairouan can get very hot during summer, and visitors to the city at this season should take necessary precautions.